1We are used to visiting a museum, going to a memorial, gathering our thoughts beside a monument or simply going to discover it, to look at it out of curiosity. We forget that it is generally placed within a network of other sites and as such contributes to its meaning. A memorial is raised next to a museum; a monument preceded both of these by thirty, sometimes fifty years, and if it is not an artist who adds the final touch to the setting then it is another museum, not far away, that opens its doors. This phenomenon is gaining momentum today. It requires us not to think about these memorial places in isolation from each other, but rather in interaction with each other, and to meditate the very experience of the journey that leads us there. An experience where our footsteps carry us toward memory, on roads interspersed with other memories, intervals, turnings, forgetting and trivialities, which can at times be quite necessary. Berlin. 2007. Holocauste Memorial (Denkmal für die ermordeten Juden Europas). 2Consider going down to the Memorial to the Murdered Jews of Europe at the heart of Berlin. It represents in itself an entity with a dual history. The history of the Nazi crime and the history concerning its memory after the reunification (close to fifteen years of discussion ending in 2005). But we can also raise the question of its location. 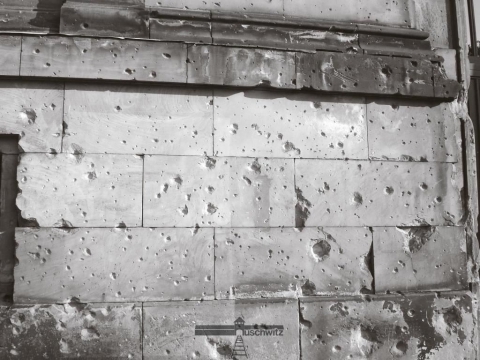 In order to reach it, one must previously have physically crossed a complex layout of structures, levels and passageways full of history, memory, cultures, and also economic concerns indifferent to the history and to the memory of a city that today still bears on many of its walls the impact of the fights of April 1945. The location of the Memorial to the Murdered Jews of Europe is set at the crossroads of several paths that come and go between different sites. On one side, the Brandenburg Gate with its neo-classical style dating from the beginning of the 18th century. A bit further, along the forested area of the Tiergarten, the dome of the Reichstag solemnly stands for the long lines of curious people. On the other side, the Potsdamer Platz emerges like a mirage in the place of the former no mans land that “long ago” separated the East from the West. A business centre has sprung up and vast shopping malls with walls carpeted by screens imitating Time Square have blossomed in its place. Let’s widen the perimeter. We then have the Topography of Terror, the Jewish Museum, and, on the other side, the German Historical Museum, the Bebelplatz where the historical Nazi book burning ceremony took place and now where Micha Ullmann’s installation is situated (the underground “Bibliotek” Memorial – 1995). Berlin. 2008. Façade bearing the impact of the April 1945 shootings. 3I had a similar feeling – this may seem paradoxical, or even odd as both cities are so different – when I headed toward the National 9/11 Memorial in Manhattan that has recently opened to what is called the “public”, which I am a part of. All of this must be understood mutatis mutandis, without any intention of comparing the events these constructions respectively refer to. For several months yet – I am writing these lines in June 2014 –, we will have to make our way there through numerous construction sites. It feels as if we were still at the end of the 1990s at what became not long afterwards the aformentioned Potsdamer Platz. Huge cranes boast above our heads, as large insects which, perched on gigantic wheels, swallow every possible kind of material, some of which have only recently been given a name in order to raise new temples where the memory of the terror (the 9/11 Museum was only to open mid-May) and the power of business are already and forever near, as the transcendence of capitalism conversely joins the impossibility – naturally transcendent – of measuring the wrong that was suffered. New York. 2014. 9/11 Memorial. 4And us, visitors, take a sinuous route carefully overseen by security guards, policemen and guards making sure as much so that no one gets lost as that the order of our passage, person after person, is carried out conscientiously whilst respecting a precise ritual. Each ticket is verified and ticked, to be verified again up to three or four times. One by one we pass through a turnstile that scans us from head to toe however not dispensing the next guard from asking us – with the simplicity of American politeness which is disconcerting when we come from France – if what we have in the inner pocket of our jacket is in fact our wallet and if, on the other side, there are in fact some pens. Let’s not be mistaken, the role that the security staff is truly fulfilling, is performed perfectly and thus participates in the dramaturgy of the memorial. In addition to this troupe, we also find guides at the disposition of the public, who tell the story for example of a tree that survived the incandescent ashes. They offer advice and inform the public faultlessly. 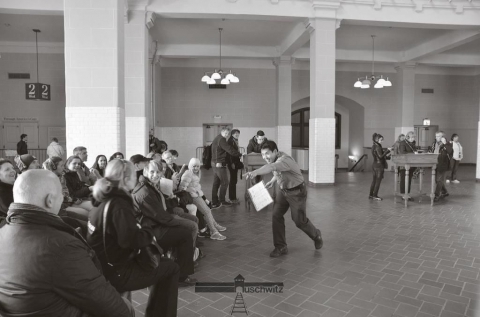 We recognize a similar performance from the guides dressed in Ranger uniforms that welcome us at the Ellis Island Museum (this island, which has became part of our heritage served between the end of the 19th century and until the middle of the 20th century as a place of examination to either authorize or not entrance to the most needy of immigrants onto American soil). 5The Plaza of the Memorial is now open. Paradoxically, the effect is less impressive than what I had expected. The Memorial’s twin pools, each 4000 m² in size and supposed to symbolise the base of both towers, would be more aesthetically striking if it were possible in situ to adopt the same point of view as the computer generated images offered on the Internet. Thus the subtle position of the fountains, creating a reflecting absence effect, does produce the dizzying sensation that the virtual models prepare you for. The concept and its estimations remain above their concrete realisation, without exactly realizing them. It is also in this sense that there is a form of transcendence, that the idea cannot coincide with its reality. A gap that certainly responds to the necessity of not managing to control what took place by framing it within the collective geometry of memory. 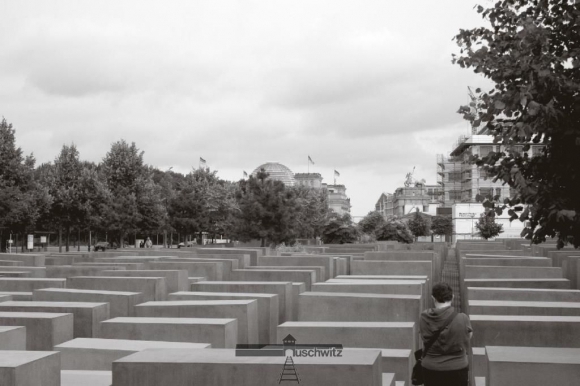 6In Berlin, the route between the steles of the Holocaust monument, none of which are equal in inclination or in size, forbids the visitor from becoming a spectator and from viewing the whole memorial site. 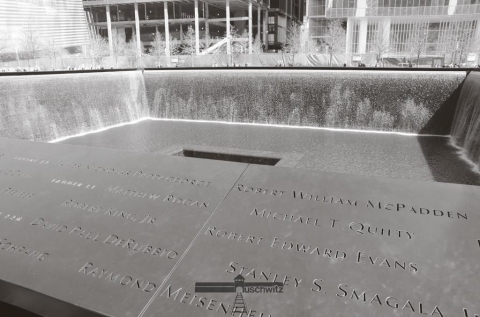 In the same way, here in Manhattan, the names of the three thousand victims engraved on the eight edges of the parapets surrounding the pools aren’t oppressive and naturally we cannot visually grasp the site in its entirety, even if we have the feeling that it is within reach. 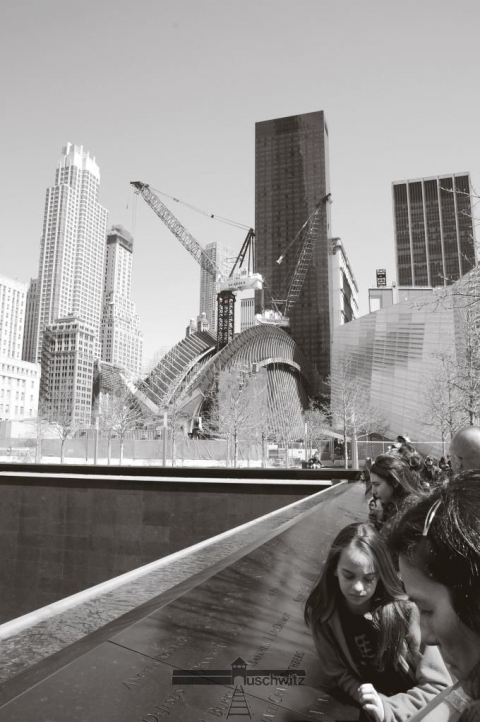 If there is a sense of grandeur, it is because the monument is continually uplifted by the visitors, from which emanates, despite the urban bustle, a sense of calm that propels us to read the names of the deceased, to go toward the tree that survived, to feel the air settle at the foot of the new One World Trade Centre. The structure indeed rises above every skyscraper in New York at 510 meters high and, finally, makes you feel the quiet reflection of the crowd. In this way, the real monument is the way in which people occupy the space much more than a perfectly configured site, unless it is precisely designed to humbly withdraw before the commemorative tension created by the presence of those who have gathered for reflection. 7Let’s make our way out of the 9/11 Memorial and go back to the wider definition of the memorial site as I outlined above. At the tip of Downtown, a triangle is delineated and covers in part, but upside down, the natural triangular shape of Lower Manhattan. “Ground Zero” as we may have guessed, is the inside tip of the triangle. Before embarking for Ellis Island, you will have to purchase a ticket for the Statue of Liberty and Ellis Island, the two other tips of this triangle which offer a different reading of the ground we tread upon. Nothing, obviously, in the minds of the organizers, justifies that we should only go to Ellis Island, since we are of course curious of the Statue (it is similar to the “unmissable” triangle Krakow, the salt mines of Wieliczka and… Auschwitz). As it is trivially said, one must “go all out” and see them all. This expression, though very unpleasant to the ears, is perhaps not so stupid. In the minds of the agencies, one must not miss anything anymore. The visitor expects to be fully satisfied. New York. Battery Park. 2014. In front, The Sphere by Fritz Koenig (1971, originally Große Kugelkaryatide), relocated after the attack on the Twin Towers. Behind and on the right, Mac Adams’ Korean War Memorial (1991). In the background, the One World Trade Center. 8This memory triangle acquires all its significance on the quay at Battery Park, its greenery bordering the Hudson. Waiting to embark for Liberty Island means having patiently walked for at least an hour along the memorial to the American Soldiers who died during the Second World War (eight huge rectangular steles, four on each side, with a victoriously stylized eagle), Fritz Koenig’s famous sphere that, after having been severely damaged during the attacks on the Twin Towers, was placed on these very banks, as well as Mac Adams’ Korean War Memorial. This makes quite a few in a relatively small space. And if we were to search further, there would be more yet to discover. Thus, without even having placed one foot on the boat that will take us to Ellis Island, memories of war and of terror saturate the few hundred meters where queues of visitors stand waiting. Let’s go directly to the island forming the last tip of the triangle, Ellis Island. 9Ellis Island has become a clean and explanatory museum (which was not the case in Perec & Bober’s film), entirely remodelled, presenting all of US history and, at the same time, celebrating it. The guides perform for free, at times with a dramatic and solemn enthusiasm, at other times with an exaggerated burlesque, the same role they would have held a century earlier (I filmed one of them, a real character). Quantities of photos, objects and facsimiles don’t manage however to bring closer together the massive walls of the rooms where the immigrants of the old Europe, confined, awaited their destiny. Finally, the most touching room doesn’t have anything else to see beside monitors (the placards and relics around the room remain basically unnoticed), in front of which three or four people, from the same family I suppose, sometimes more, are standing trying to find one or a few names on the computerised lists, or on archive documents that have been scanned. Here again, it is individuals – let’s call them individuals rather than visitors – that give the site its atmosphere, a glimmer that the scenography is unable to maintain. Perec, Georges & Robert Bober, Récits d’Ellis Island, histoires d’errance et d’espoir [Ellis Island, stories of peregrinations and hope], INA, 1979. A book was published simultaneously with the film at Le Sorbier/INA. Prazan, Michaël, Angel Island, l’autre visage du rêve américain [Angel Island, the other face of the American dream], Arte – Les Films du jour, 2014. Sturken, Marita, Tourist of History: Memory, Kitsch, and Consumerism from Oklahoma to Ground zero, Durham & London: Duke University Press, 2007. 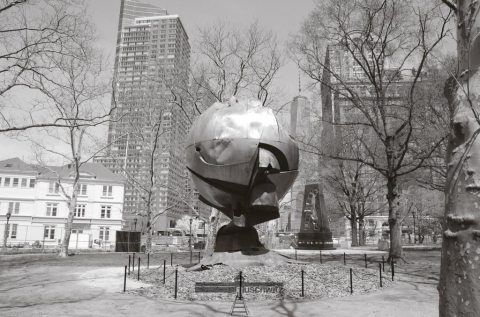 Philippe Mesnard, « Memorial site: Downtown memorial », Témoigner. Entre histoire et mémoire, 118 | 2014, 194-199.